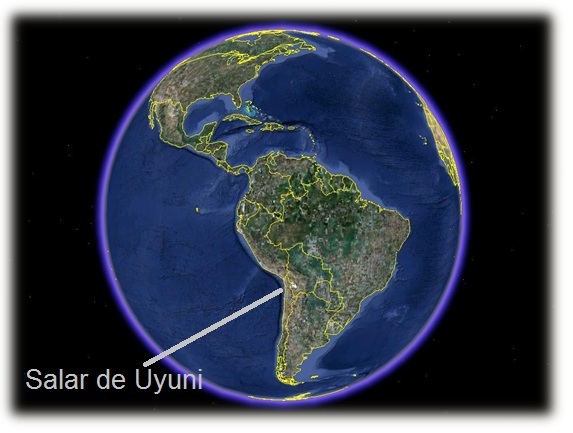 The Salar de Uyuni is visible from space! The bike awakens after a frozen night in the desert, south of Uyuni. In the background is a train that's having a hard time getting started. We arrive in Uyuni: cold, tired and hungry. Christi tucks into a breakfast of "chicharones" - fried pork on potatoes. She douses it with spicy salsa. Tauru pushes the bike through the dusty streets of Uyuni. Not sure what the statue is about, but it perks Tauru's curiosity. Many towns use round-abouts for intersections. It's common to see sculptures in the center representing icons of the city. In Cambodia, one town has a giant crab in the center of a round-about and another town has a giant durian fruit at the center. Here, we wonder what is the significance of this sculpture? Water is scarce in the desert, so we stock up on supplies. A busy intersection near the traveling market in Uyuni - lots of life in this town. Tauru meanders along and finds more supplies for our foray to the salt flats. But it's lunch time, so he eyes some food vendors. We leave town and head down one of the most difficult and treacherous dirt roads we have encountered. It's sandy and bumpy where it's packed dirt. After crashing (front wheel riding off the road into a soft dirt embankment while avoiding a speeding vehicle), Tauru takes a break with his favorite kind of water. Lured by the sight of salt on our left, we thought we could take a shortcut to get to them faster; but distances are deceiving in the desert and we are forced to return to the main road. Unfortunately, the path back is not easy. We push the bike through soft sand for what feels like an eternity. We find an abandoned structure that provides protection from the wind and call it home for the night. We wrap ourselves in everything we own, put on our down jackets, and zip up tight to keep the cold air out. Only Christi's nose is exposed. Finally, we reach the salt flats! Salt doesn't absorb the sun's heat like dirt or sand, and so it's cold. As we ride, the salt crackles as if we were on ice. Where's north, south, east or west? Hope this is the way to Alaska.